The story of the people and places that shaped Birmingham's role in the history of rock. written by Laurie Hornsby & edited by Mike Lavender with foreword by Carl Chinn. Published by TGM Ltd. 1999. At last! - a published work that deals exclusively with the influence that the early years of rock 'n' roll had on the development of the Birmingham music scene. Laurie Hornsby is a well known local historian in Birmingham and his recorded works such as The Brummagem Air and Any Road Up! are familiar to many as both fond and humorous recollections of what it meant to be a "Brummie" in working class Birmingham. In Brum Rocked!, his first book, he has done a first-class job in telling the story of how Birmingham’s entry into the rock 'n' roll era would shape the lives of many of its citizens and eventually bring a lot of talent from the front rooms, church halls, and youth clubs, to the superstadiums of the world. Moreover, it is a story of those who pursued the rock 'n' roll dream and their adventures along the way. The book covers an approximate 10 year period from the mid 1950’s with the first importation of rock 'n' roll from America, up until the mid 1960’s at the height of the British beat boom. Written in Laurie Hornsby’s characteristic style and humour, the book is full of recollections from those who participated in the Birmingham music scene and many who tell their own stories for the very first time. Brum Rocked! does a great job in regards to following the tangled trails that led to the formation of some of the era’s most well known and influential groups as well as those who were unknown outside of the Midlands. Famous names like the Moody Blues and the Spencer Davis Group are just a few of those mentioned, while other local heroes such as Danny King, Keith Powell and Pat Wayne are amongst many others to be documented in detail. Up until now, most of the groups and individuals who played a part in the making of the West Midlands music scene of that era have been virtually ignored unless they were in some way connected to a famous group, and even then, the information available about them was often incorrect or misleading. 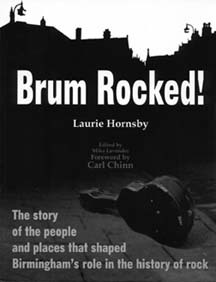 In Brum Rocked!, Laurie Hornsby finally sets the record straight by telling the stories of many Brumbeat personalities, known and unknown, who helped to create a scene that allowed so much individual and collective musical talent to flourish. Brum Rocked! also documents the venues in and around Birmingham that provided a setting for so many of these groups. Some such as the Carlton Ballroom, the Golden Eagle Pub, and the Cedar Club which in my opinion, are of no less significance than Liverpool’s Cavern or London’s Marquee are mentioned, as well as many other local haunts that remain but distant memories today. At over 130 pages, Brum Rocked! is packed with more than a hundred rare and previously un-published photographs, and combined with the personal recollections from dozens of Brumbeat personalities, it makes for a very interesting read which is hard to put down. Also see review of the follow-up volume Brum Rocked On!